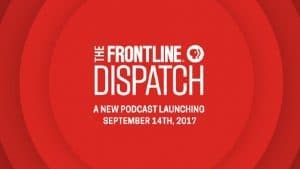 PBS’ long-running investigative journalism series Frontline is pleased to announce the launch of its new podcast series The Frontline Dispatch. Each episode will focus on uncovering crucial domestic and international stories, and will unfold with the sensibility of Frontline’s award-winning documentaries. These reports, however, will cover different ground, be told for audio, and be narrated by reporters around the country and the world. The Frontline Dispatch’s first season premieres Thursday, September 14, 2017, with an exploration into child marriage in America. New episodes on second chances for juvenile lifers, a community divided over fracking, and more will be released biweekly on Apple Podcasts, Stitcher, RadioPublic, and other podcast apps, and at pbs.org/frontlinedispatch. Jay Allison, the creator of The Moth Radio Hour, is senior editor and creative director, and the show will be distributed by PRX. Episodes will be introduced by series executive producer Raney Aronson-Rath.